Franco-German armistice negotiations begin at Compiegne, during which Hitler informs the French representatives of his terms in the same railway carriage as the German surrender was signed in 1918. Hitler issues a proclamation announcing the end of the war in the West and orders flags to be flown throughout Germany for ten days. The Polish government-in-exile arrives in London. Hitler orders German subs not to attack US warships. 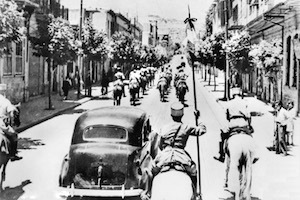 British forces occupy Damascus, while another British column invades Syria from Iraq. Vichy France excludes Jews from schools. British General Sir Claude Auchinleck replaces General Archibald Wavell as C in C forces Middle East Command; while Wavell takes Auchinleck’s place over Indian Army. Free French occupy Damascus, Syria. US State Department orders closure of all Italian consulates in US by July 15. The Luftwaffe carries out a night raid against Southampton. German infantry and combat engineers of 11th Army are gaining ground slowly in their assault on Sevastopol, but the ferocious Russian defense at Sevastopol forces Adolf Hitler do something he doesn’t like to do, namely delay the German Summer offensive. General Erwin Rommel captures the port city of Tobruk in North Africa. The Germans capture 32,000 prisoners, 2,000 tons of fuel, 5,000 tons of food and 2,000 vehicles. The RAF launches a heavy raid on Krefeld in the Ruhr, but lose 44 aircraft. Allies advance to New Georgia, Solomon Islands. The US 8th Air Force carries out raids on Berlin and the synthetic fuel plants at Leuna-Merseburg, which then continue on to Russia. A further Russians assault against the Finns opens in eastern Karelia. The Red Army begins an offensive between lakes Ladoga and Onega on the northern front. Organized resistance on Okinawa ends after 82 days of the bloodiest fighting in the Pacific, during which 98,654 Japanese have been killed and 6,922 captured. U.S. loses were 6,990 killed and 29,598 wounded.